South on SR 56 from Rising Sun. Sign on. 2+ acres of prime riverfront property with 145+/-feet of shoreline and road frontage. Perfect for a recreational retreat, camp site, or RV park. Plenty of level ground for vehicles, outbuildings, and boat storage. Don't miss this opportunity! 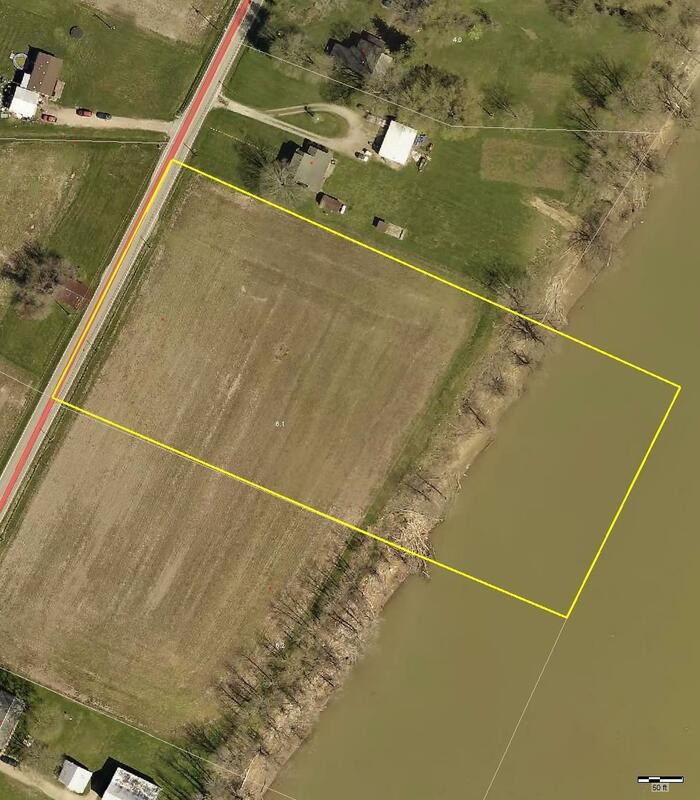 2+ adjacent acres for sale as well. Seller financing may be available. NOTE: This property was sold on 4/20/2018 and is no longer available. The details listed below are believed accurate to the date of the sale and are subject to change. Named for the breathtaking sunrise seen over the rolling Kentucky hills by one of its earliest settlers, Rising Sun has long hosted inventors and those who think out of the box. Early industry focused on steamboats, the modern electric chair, and ironically, gaming machines. Today the fast paced excitement of Las Vegas style gaming with star studded entertainment on area Riverboats, or enjoying the slower pace of historic river life are all found in Rising Sun- Indiana's Rivertown Resort. Following the scenic Ohio River west out of Cincinnati, Rising Sun is 45 minutes from Cincinnati located on St. Rt. 56. The Greater Cincinnati and Northern Kentucky International Airport is about 20 minutes away. Residents can reach any part of the city by in a relatively short distance. Nearby Dearborn County Hospital in Lawrenceburg serves the county's medical needs, in the midst of a $38 million construction project increasing the hospital to meet growing population demands. Margaret Mary Community Hospital in Batesville is the closest community hospitals. Hospitals in Cincinnati are an hour drive away. A burgeoning artists community can be found on Main Street, with many one-of-a kind stores and something for everyone. Specialty shops and restaurants abound on the tree-lined streets. More basic daily needs can be found in nearby towns of Lawrenceburg or Batesville. If an active lifestyle is for you the only choice is deciding where to spend your time! Water sports take advantage of the scenic Ohio River with boating and fishing very much a part of outdoor recreation. Entertainment includes the nearby gambling boats with not only their gaming opportunities but also their entertainment and sports complexes. Gardeners will enjoy a specialty herb farm, and historians will seek out the Ohio County Historical Museum, and numerous other downtown architectural gems. Rising Sun hosts Indiana's Award winning arts community. In 2003 the Governor of Indiana awarded Rising Sun the 2003 Governors Arts Award for its innovations, and the Indiana Main Street Project awarded Historic Downtown Rising Sun the "Innovation" Award for its "Arts as Education" concept. And not to be missed, a stroll along the waterfront to enjoy the view!